Outputs 1...8 can have 8 traditional analogue or digital servos attached. 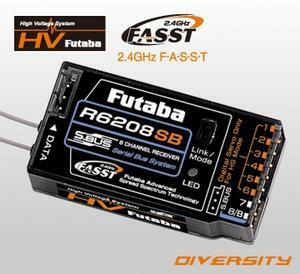 The R 6018SB receiver has a switch to select between Digital and Analogue servos. The signal pulse for digital servos on servo outputs 1-6 is even faster, which can give an even shorter latency time. Up to 18 of the new, programmable S-BUS servos can be attached in series directly to this output. Digital addressing means the servo reacts only to information which holds the correct servo address. No more cable spaghetti, one connection to the wing, on larger models a cable per wing and a cable to the tail. This cable - and with it the weight-saving process, can of course also be accessed by existing analogue or digital standard servos: for this a PWM adaptor is inserted which converts the S-BUS signal to PWM.